Flixton Manor is proud to have received glowing commendation from Care Quality Commission. 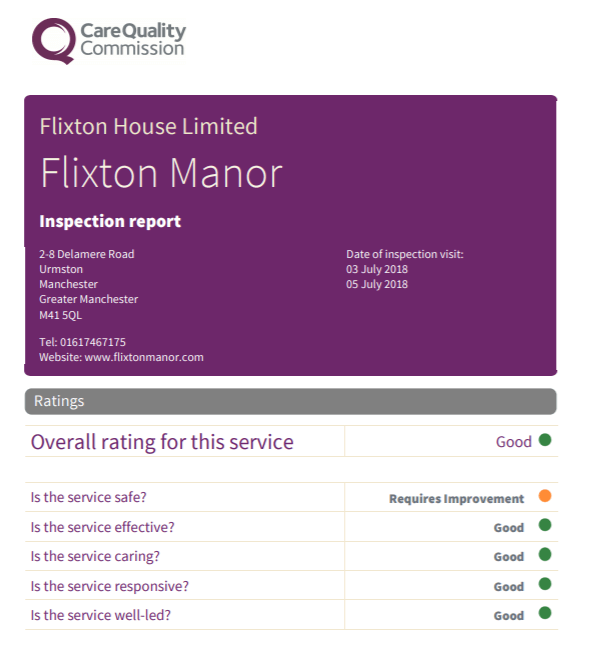 This is further testament to the dedication of our staff and how all of us here at Flixton Manor are focused on delivering the foremost levels of resident care and comfort. As the independent regulator of health and social care services in England, Care Quality Commission are responsible overseeing and scoring the adeptness of care homes across the UK in caring for the health and well-being of their residents. Setting the high standards that care homes in Manchester should aspire to meet, CQC assess each care home with a strict criterion – one that is designed to highlight proficient care and identify areas of improvement across every aspect of a care home. Following our last inspection in June 2017, we were asked to provide an action plan to improve a single area of our service. On recent inspection, CQC were satisfied that we have sufficiently addressed this individual area – thereby resulting in us delivering an exemplary level of care to all residents across every area of residential care. What we were most pleased with was the recognition of the personal nature of our services. Inspectors noted that we engage frequently with our residents, treating them with respect and courtesy, seeking their permission when required. Our knowledge of each individual resident in our care – including any treatment and personal preferences – was also noted and highlighted on the inspection’s findings. This reflects the resident-centric ethos of a skilled nursing facility and is something that we’re happy to have been recognised for. CQC also noted that positive interactions between our staff and residents were observed. Staff members were praised, with residents admitting that they felt listened to by our staff. In addition, we were further praised for providing regular activities for our residents to indulge in, and our management team were noted for being friendly and approachable. We’re very proud to have been commended so highly and intend to use CQCs report as a benchmark, allowing us to consistently improve the prowess of our services. Learn more about why Flixton Manor is considered one of the foremost care homes in Manchester today by calling 0161 746 7175. One of our friendly staff would be happy to help you.